Are you building a presence on Twitter? Want to start with a solid foundation? Twitter is a great platform for establishing yourself, growing an audience and making important connections. In this article you’ll discover what you need to do to get the best results by using Twitter marketing. Thanks to Ishita Ganguly for sharing this article. 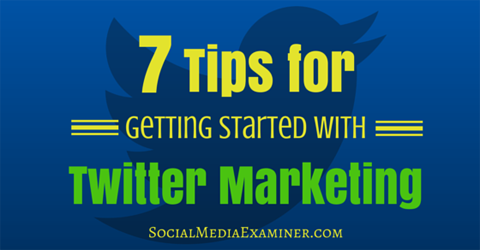 Discover seven tips for getting started with Twitter marketing. Completing your Twitter profile is the first step to creating a personal brand. Let’s face it, an incomplete or vague description and an eggshell for your Twitter profile photo don’t exactly project a professional image. Remember, too, that Twitter lets you include links in your profile, so use this space strategically. Include your name in your profile so people can recognize you easily. Also, add a professional-looking profile photo. 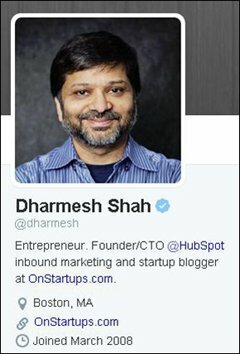 In HubSpot founder Dharmesh Shah’s Twitter profile, he includes a photo, lists professional details in his bio, shares his location and links to his personal blog. Fill out your profile completely and add a professional photo. Twitter modified its header photo size a while ago, so now it’s bigger and wider. Pauline Cabrera utilizes this space effectively for her Twitter account. She lists her expertise and services in the same frame, so whenever users visit her profile, they can quickly see all of the important information about her. Pauline Cabrera effectively uses the header photo space to convey important information. 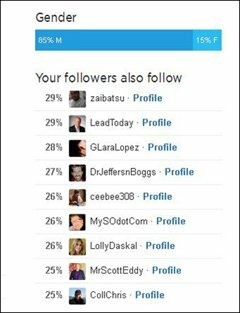 To find people in your industry to connect with, log into Twitter Analytics and click the Followers tab. Take a look at whom your followers follow to see people who may be in your niche. Find out which users your followers follow. In addition to Twitter Analytics, you can use tools like Klout and Kred to find like-minded people on Twitter. Identify people to connect with in your niche. After you identify people of interest, follow them. Don’t just retweet their tweets randomly. Keep a close watch on the content they’re sharing. Read their tweets and share your opinions. You may not hear back from them right away, but once they recognize you’re adding value, they will start responding. Another way to connect with influencers is to tag them with your tweets. You might ask a question or appreciate something they’ve said. By doing this, you acknowledge their industry expertise and get on their radar. To connect with influencers, tag them in your tweets. A lot of factors go into determining the best time to tweet. The time slots that work for one person might not work for you. The best way to figure out when to tweet is to use a dynamic best-time algorithm. Try using a tool like TakeOff. It’s relatively new in the Twittersphere, but it offers great promise with its algorithm. It not only helps you schedule your tweets, it also suggests the best times to post them. 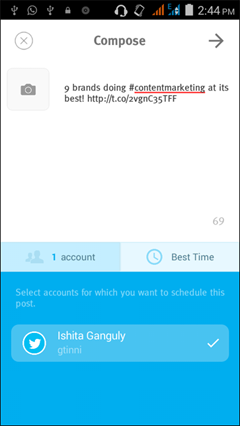 TakeOff calculates the best time for you to tweet to maximize engagement. Wondering how the app does it? By analyzing your followers and their online behavior. Twitter offers great potential to reach out to important people in your niche, but you need to give them a reason to follow you back and spread your message. One way to find great content to tweet is to set up Google Alerts for certain topics. Use Google Alerts for topics you want to follow. If you’re unsure how to choose the best topics for your niche, Twitter Analytics can help. On the Followers tab, interests are categorized two ways: unique interests and top interests. Just focus on the top interests list because it includes the unique interests as well. 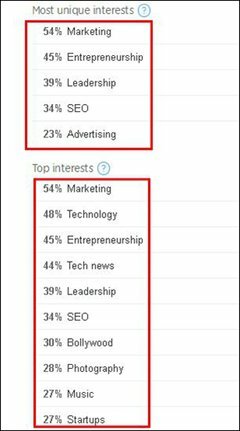 Use Twitter Analytics to find good topics for your niche. Content curation is an important part of Twitter marketing, as it’s next to impossible to create lots of content on your own. But don’t curate content just for the sake of it. Add your own take with your updates. If you share a post without commenting on it, your followers may not get much value from it. Adding your own point of view improves engagement. Twitter’s new Retweet with Comment feature embeds another user’s tweet and gives you 116 characters to add your own comments. This means you no longer need to shorten the original tweet to free up space for your take. And people who retweet your retweet get the same number of characters to add their own comments. Make sure you add a comment when retweeting. Twitter chats are one of the best ways to connect with other Twitter users. You can either organize your own chat or participate in one. There are tools to help you find the most relevant Twitter chats. For example, TweetReports provides a free Twitter chat schedule, and you can narrow the list to just the chats that are available at a specific time. TweetReports provides a Twitter chat schedule. You also can register your own Twitter chats on the website. Fill out the form with all of the required information about your chat. Once it’s listed, anyone can see it and join. After scheduling your chat, you need to get prepared for it. A tool like TweetChat helps you conduct your chat sessions. All tweets with the designated hashtag appear on your screen. You can reply, retweet, favorite or view the entire conversion from this platform, so there’s no need to go back to Twitter. 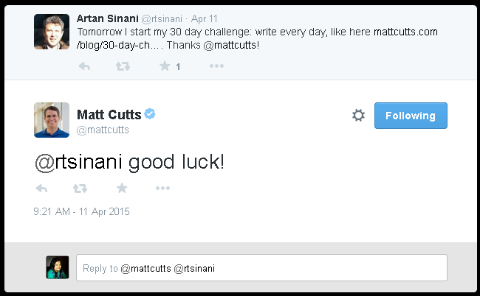 TweetChat lets you replay, retweet and favorite directly from the app. Always try to add value to Twitter chats, whether you’re hosting them or not. If you’re planning to host a chat, spread the word on various social networks. Ask your friends to participate and give them a reason to join in. Organize chats once a month and Twitter users will soon start taking notice of you. It’s nice to be greeted, but Twitter users are smart enough to know if a welcome message is automated or personalized. Automated Twitter messaging can be a great tool if you use it right. Start with a clever question that can’t be ignored. But remember that you’re asking a question and some users will probably answer it. So, check your inbox frequently to continue the conversation. If you want to send an automated message, try asking a question. Is your Twitter profile included in your author profile and other social profiles? If you don’t link to your Twitter profile in articles you’ve written, you’ll likely miss out on many new followers and mentions. Adding your Twitter URL is an easy way to guide users to your Twitter profile. I included my Twitter profile in my Social Media Examiner author bio. Whenever users click on the author link, they’re redirected to my Twitter profile. Include your Twitter URL in your author bio. Over to You Twitter is a wonderful platform for personal branding if you use it the right way. Building a personal brand takes time and patience, but if you stick with it, it will pay off. What do you think? Have you tried any of these tactics to grow your brand on Twitter? What techniques have worked best for you? Please share your thoughts in the comments below.